Putting your animal in a cage or crate can stop the hair from spreading around the car. Instead, it will stay within the confines of the crate or car. 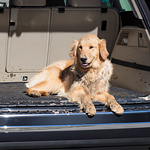 Generally, all you have to do to clean out a cage or crate is take it out of the vehicle and dump it out. You can also choose to sweep or vacuum these items for best results. Don't use lint rollers to collect pet hair. This is because they aren't as effective on vehicle cloth. Instead, use a static charge to collect hair with ease from seats or other vehicle surfaces.